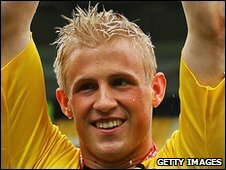 Leeds United have agreed to sign keeper Kasper Schmeichel on a two-year deal, following his release by Notts County. The 23-year-old Denmark Under-21 cap kept 24 clean sheets for League Two champions County this season but left because of his high wages. The former Manchester City goalkeeper told the club's website: "I've grown up in England and I know Leeds is one of the biggest clubs in the country. "There were other opportunities, but Leeds has everything." The Dane added: "It's a massive club and has a massive fan base. "I've experienced winning the league and once you've won a trophy you want to do it again. I can't wait to get started at Leeds. "I hope that we will do really well and get promoted, but the Championship is a weird and different league. "Look at Blackpool last season who came from nowhere and got promoted." United manager Simon Grayson said: "After releasing Casper Ankergren we wanted another keeper. "He's got fantastic ability, he's a winner and he's determined to take this club forward." Grayson says he has fought off top-flight competition to make the former Manchester City player his first summer signing. He said: "There were a lot of Premier League clubs interested in him but he wanted to come here. "He has some fantastic qualities and he will provide us with good competition for places which is what we want." Schmeichel has made over 140 career appearances having played in the Premier League for Manchester City along with loan spells at Darlington, Bury, Falkirk, Cardiff City and Coventry City. The deal will go through on 1 July.